Are you bound for a bowfishing adventure? Well, before proceeding to the waters, let’s first understand how it works! Bowfishing is another method of fishing with the use of specialized archery equipment. It can be done both in salt or freshwater and can be participated by anyone - including women, men, and children with their bowfishing bows. Further, it can be conducted during the day or night, although most bowfishing hunters prefer to go for bowfishing at night. This is primarily because fishes get attracted to their light making the shot easier. Some freshwater species that are hunted are grass and bighead carp, paddlefish, tilapia, and alligator gar. If you want to try in some saltwater fish, your preys will include barracuda and redfish shark. All vary depending on the rules you have in your town. Usually, these fishes are shot with a barbed arrow attached to a bowfishing bow. The bowfishing method aims to improve the skills of bowhunters in hunting by extending their hunting territory. Meaning, they not only gain mastery on archery but also in hunting and fishing. The prime reason for is to take advantage of the waters instead of focusing merely on the land animals. Indeed, having all your prey on your table is one of the most wonderful trophies. With the correct equipment and a bit of practice, you can be a successful bowfisher! Always remember that bows are designed with different features. It’s a matter of choosing the right one for your purpose and need. Most bows are designed for right-handed people, while others are designed for both right and left-handed ones. It also differs in length, draw weight, and range. 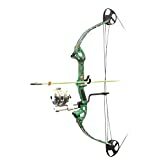 However, most archery and hunter enthusiasts choose the bows that will fit both in archery and hunting or fishing. As you keep reading in here, we assure to provide you with a guide on the preliminaries before proceeding to your bowfishing adventure. Similarly, we’ll give you five of the best bowfishing bows that will surely make your experience more efficient and enjoyable. Bowfishing is considered a great bowhunting practice, especially during summer and spring. Basically, the term bowfishing is defined as bowhunting of fishes. You first spot your prey, stalk it, and shoot it with your bow. To get started, you also have to obtain a complete gear for your hunting. At the same time, skills and mastery are still vital although targets are abundant. It can be conducted during the day or night, although most bowfishing hunters prefer to go for bowfishing at night. Bowfishing hunters can also choose between standing on the boat or staying at the shore. Night hunting is more preferred as it gives a more romantic vibe with nature. Also, the night light provides more thrill and joy in hunting. There are several freshwater species that you can hunt. Some of these are the grass and bighead carp, paddlefish, bowfin, tilapia, alligator gar, and catfish. If you want to try hunting in saltwater, your preys will include the Barracuda the redfish, flounder, and even redfish shark. All vary depending on the rules you have in your state. Usually, these fishes are shot with a barbed arrow attached to a bowfishing bow. The most common prey in bowhunting is the common carp. The carp is a non-native and nuisance species being regarded as the “pest fish”. This is primarily because the common carp has a tendency to destroy vegetation when it became widespread. Similarly, the carp does not only pest vegetation but also the eggs of other fishes like trout. In effect, Colorado’s trout find it hard to repopulate. The common carp, as a prey, is definitely encouraged by some state’s government to be hunted. This is to protect the fishing industries and livelihood of their people. At the same time, this is also to prevent the extinction of other species. Prey, especially carp, are commonly found in ponds, lakes, and other lower portions of rivers. As noted, the preys can be usually found in all spots of the lake, mostly near the banks and other water structures such as buoys, docs, and water breaks. Since carps enjoy eating vegetation, plankton, and detritus, they tend to grow in the aforementioned areas. Similar to archery bows, there are a lot of options when it comes to bowfishing bows. Some of these are the recurve bow and the compound bow. Firstly, the Recurve Bow features a curved and long apparatus that was constructed with the aim of aiding spontaneous shooting. Typically, bowfishing recurve bows have a weight of 50 pounds packed with features for easy operation. If you plan on buying this type of bow, make sure that the recurve bow you’re eyeing on contains a stabilizer hole. This is to maintain stability and direction accuracy. Generally, the recurve bows in bowhunting are relatively price-friendly and definitely a great choice for beginners. On the other hand, the Compound Bow is a shorter version of the former mentioned type. It contains a no “let off” or a “let off” feature. When we say no “let off”, the bow produces higher speeds than the “let off”, but is still slower than recurve bows in totality. 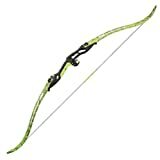 Although the compound bows are energy efficient, this type is still not recommended for beginners. Instead, it can be a great choice for advanced hunters who are searching for impressive velocity, humidity and temperature-resistant bows. Whatever type you choose, always choose the one with the draw weight that fits your capability as well. The draw weight refers to the amount of force you need to apply to the bowstring to pull it over a distance. Higher draw weight will result in a more powerful and farther travel of your arrow. Unlike the typical hunting which requires you to draw your arrow once or twice each day, bowfishing requires you to do it for about 50 times a day. In this case, the suggested weight of the draw weight for adults can range for at least 35 pounds and above. The arrows to be used in bowfishing should have greater strength and heft in contrast to the typical archery arrows. This is to enable the arrow to penetrate well in the target despite the denseness of the water. Usually, bowfishing arrows are made of fiberglass, carbon fiber, or solid aluminum construction. Meaning, the arrows used for bowfishing are not really designed for speed but generally for the force. The feathers and fletching that are usually found in the typical archery arrows are not present in bowfishing arrows. The fletching is added to boost the velocity and power of bows. However, the same feature reacts opposite to bowfishing arrows. Instead of powering up, it reduces the velocity and power of the arrow producing weak results. In choosing the arrow reels for your bowfishing adventure, there are lots of options you can consider. Some of these are hand wrap, retriever, and spin cast reels. If you want the simplest one, you can go with hand wrap reels as this can be operated manually. The hand wrap is the type of reel which is comprised of a circular spool that you manually wrap during retrieval. The retriever reel, on the other hand, works very simple as well. It is generally comprised of a bottle holding the line in place. Given that the two can easily be operated, it is best used by beginners. However, if you are a professional fish hunter, you can go for the spin cast reel with greater speed and precision. It is designed with advanced features that can only be handled by professionals. The arrow rest is commonly purchased with the arrows. It serves as a good rest and holder to your arrows which allows you to carry it in bulk. Since fish hunting arrows are heavier than the typical archery arrows, most people prefer to buy the roller-type rest. It works by spinning as the arrow passes over it. While the collapsible type automatically moves out of the way upon your string release. The PSE Kingfisher Right Hand Bow is the right bow for those who are still beginners to bowfishing. This bowfishing package will enable you to use most of your time hunting to the fullest power and potential. The bow is built with a sturdy and solid look that is proven to be very durable. It also shoots precise with high speed and great delivery in underwater. Further, the Kingfisher bow is also lightweight at 2.7 pounds, while the entire bow measures 92.7 x 15.9 x 5.7 cm. Generally, with its size and weight, this device can be easily carried and transported anywhere you go. Hunters also love it for its dark grey and black finish! The best part of this model is that it contains a camo design being able to withstand even the harshest weather conditions. You also need to not assemble it whenever you want to go shooting as it comes as it is. The included spool also weighs 80 pounds test line allowing you to catch even large fishes. You will also get a fibreglass arrow that’s 31 inches in length. This means that you can penetrate through the scales without any hardship. This bow is made for both new and expert bowfishers with its arrow rest. The arrow rest is made from aluminium and stainless steel to ensure that it never chips or rusts even after a long time. The best part of this model is that it contains a camo design being able to withstand even the harshest weather conditions. It also shoots precise with high speed and great delivery in underwater. You also need to not assemble it whenever you want to go shooting as it comes as it is. The Kingfisher bow is also lightweight at 2.7 pounds, while the entire bow measures 92.7 x 15.9 x 5.7 cm. Generally, with its size and weight, this device can be easily carried and transported anywhere you go. Hunters also love it for its dark grey and black finish! The included spool also weighs 80 pounds test line allowing you to catch even large fishes. You will also get a fiberglass arrow that’s 31 inches in length. With all of its advanced features, you will not believe that this product also goes easily with your budget. The PSE Kingfisher Right Hand Bowfishing Kit is also durable enough to last even for longer years. 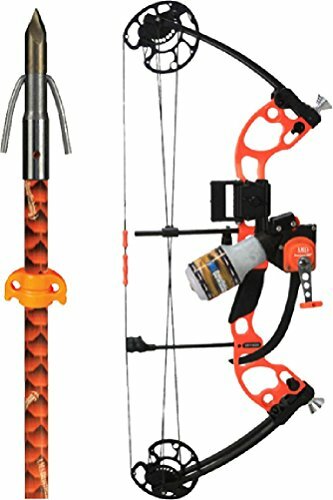 This PSE Kingfisher Right Hand Bowfishing Kit in Camo is known for having a nice and lightweight construction that can be easily stored and transported. At the same time, it contains a very impressive performance both for first-time hunters and professional hunters. With all of its advanced features, you will not believe that this product also comes at a friendly price. The Cajun Bowfishing Sucker Punch is usually the one used in extreme fish hunting. It is made with a very sturdy design with 7.25 inches height, 32.25 inches length, and a peak draw weight of 50 pounds. This bow contains 2 modules: the first one is the constant module, and the other is the specific module. This constant module contains a 60% let-off, with a bow length that can be adjusted from 17 to 31 inches. Further, the Cajun Bowfishing includes a deep cam groove that enables you to carry and transport bow easily. Said cam groove also prevents strings to derail while placed underwater. 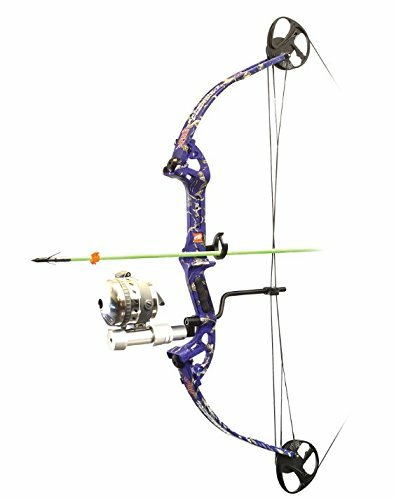 The best thing about this product is that you are given the option to just buy the bow or its whole fishing package. Either way, it is surely made for a professional hunter that takes bowfishing very seriously. 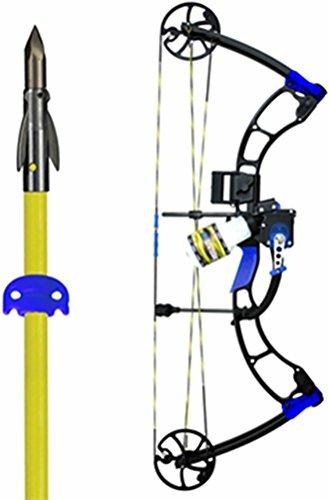 The Sucker Punch fishing kit includes finger pads, an arrow rest, a reel, and fiberglass arrows. This kit This package will provide you with effective and accurate shooting experience. In fact, the Cajun Bowfishing Sucker Punch is indeed one of the top fish hunting bows in the market today. You will enjoy bowfishing comfortably with no finger pinch. Although it is fairly lightweight at around 3.2 pounds, it still allows you to catch big fishes like alligator gars or large carps. Hence, if you are planning to upgrade on your fish hunting bow, this is definitely the best one for you. You will be able to experience a consistent power delivery and reliable performance. Above all, it is made with durability being able to withstand water pressure even for a long time. We think you’ll be very satisfied with this product. It’s durable and stands up well after prolonged use. If you’re looking for something that will serve you for a long time, you won’t make a mistake purchasing this model. It is fairly lightweight and very easy to use. It is also helpful in bringing out the performance and durability of your fish hunting bow needs. Expect to experience a consistent power delivery and reliable performance with Cajun bow. The Cajun Sucker Punch is made with a very sturdy design with 7.25 inches height, 32.25 inches length, and a peak draw weight of 50 pounds. This bow also contains 2 modules: the first one is the constant module, and the other is the specific module. Generally, the bow has a reasonable price for its overall functioning. It is specially designed with multiple upgrading and sizing options. Meaning, you can always buy this one for your kid. In case he grows faster, you will not be needing to buy an entire bow but only the replacement for add-ons. The Cajun Bowfishing Sucker Punch is a great fish hunting bow and well worth for its overall construct and performance. You can never have the same hand cramps you get with other bowfishing bows as it is designed in a lightweight construction. It is also ensured that the Cajun Bowfishing Sucker Punch will bring out the performance and durability you need for every bowfishing adventure. It is even noted for entire years of prolonged usage. The AMS Bowfishing, in collaboration with Quest Archery, recently released the latest AMS Bowfishing Juice Bow in their models of fish hunting bows. As rated by the users, this product is also noted as one of the best on the market. 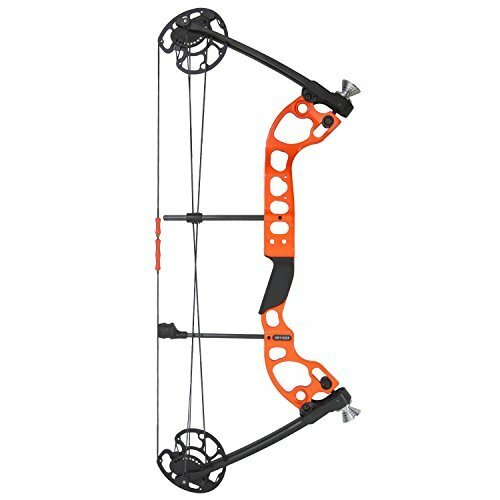 Its bright orange color and aluminum riser coat make the bow very noticeable and nice to look at. The appearance of this bow is basically stout-looking stored in a small box. It has a draw weight of 15 to 50 pounds, a brace height of 7.5 inches, and a draw length of 17 to 30 inches with an axle-to-axle of 29 inches. This only means that bowfishing hunters of all sizes and ages can use this AMS model comfortable. Further, the bow also contains an 80% let-off with a lightweight of 3.25 pounds. This means that you won’t be having any problem while you are holding the bow even for a long time. However, it is advised that you keep the bow at 30 inches to take perform its full efficiency. 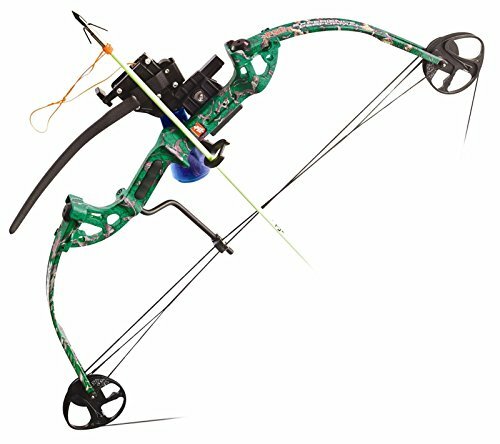 It is so compact and well-designed considering that you can adjust the bow’s size, weight, and length in any way you wish to. Therefore, if you want to go bowfishing with your kid, it is always best to start with AMS Bowfishing Juice as you can adjust the size smaller to larger and the weight lighter to heavier when he gets older. Easy to use once you get the hang of how it works. This bow can also be adjusted from smaller to larger and lighter to heavier. In this case, any person of different sizes and ages can use the AMS Bowfishing Juice Bow comfortably. It has a draw weight of 15 to 50 pounds, a brace height of 7.5 inches, and a draw length of 17 to 30 inches with an axle-to-axle of 29 inches. Further, the bow also contains an 80% let-off with a lightweight of 3.25 pounds. The price of the AMS Bowfishing Juice Bow is a bit higher than the typical fish hunting bows. However, the users of this bow expressed that the price you will pay is worth it once you get to use with the device. The AMS Bowfishing Juice Bow fits well to different ages and sizes who wish to go for fish hunting. Even kids can maximize its full power and velocity! This is because the bow has a well-made adjustable length, weight, and sizes that make it easier for you to upgrade. Although you can still customize this bow for hunting purposes, it still requires you changing a lot of parts. Also, there could be some fully furnished bows in the market that will better provide you convenience. Generally, this product can be a great deal for beginners. 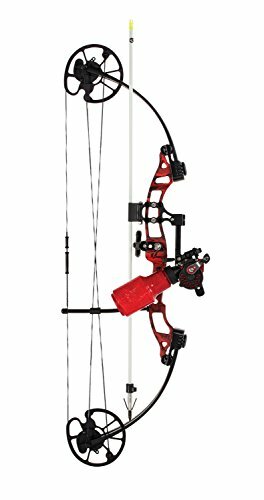 The Precision Shooting Equipment Discovery Bow Package with Muzzy Kit features a 31.5-inch axle-to-axle length and a draw length range of 30 inches. It is made of USA metal bow in a beautiful camo pattern. The kit comes with 1 Muzzy spin reel and a seat, fish stick arrow, 1 snapshot rest, a safety stop and a safety slide. It contains size and a smooth draw weight that is consistent for every user - both experienced and angler. It also contains a standard bow that can function easily. It is also constructed from durable material for long-term performance. Hence, although this model is considered as one of the most expensive bows in the market, it is still surely worth the price. The possibilities with the Precision Shooting Equipment Discovery 30-40 Bow are endless when it comes to the different types of game. Although it is a fairly lightweight, it is still packed with enough features to bring in some big-sized fish with little effort. Although it is really designed for intermediate and beginner levels, the product can also work best for professional hunters for its tested durability, power, and lightweight design. Its bow length is 62” 3 pieces “Take-Down” design with a draw weight of 35 pounds. Generally, this product is made with a heavier style as they believe it will increase its durability. Although this product is considered one of the most expensive, it still provides us with all the needed characteristics of a good fish hunting bow. This is mostly applicable given that it can work great both in beginners level and professional ones. 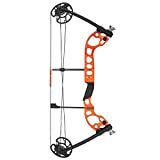 In general, the Precision Shooting Equipment Discovery 30-40 Bow is great for beginners and professional hunters who are willing to spend quite a lot of money on their beautiful bow. It is a dedicated bow that requires little effort for you to target larger fishes. The AMS Bowfishing once again collaborated with the company named G5, to make this model the best they could. The bow’s compact design is a combination of a solidly machined aluminium riser and a smooth draw. Along with the kit, an arrow rest, a string assembly, and a DVD instruction video are also provided. The whole bow structure is only 3.6 pounds in weight designed for both left and right-handed users. Generally, this device has a fairly good draw weight range of 30 to 60, a brace height of 7.5 inches, and a snapshot range of 15 to 31 inches. There is also a smooth draw cycle because of its included dual cams. The AMS Bowfishing E-Rad Bow also contains beautiful blue accents that provide an impression of a serious bowfishing adventure. Indeed, it is given that the spectra line also allows you to catch large fishes, even sharks! It also contains cycle top giving out an easy and smooth penetration in almost all surfaces. Overall, this model is definitely good for both new anglers and those who are experienced. The AMS Bowfishing E-Rad Bow provides superior performance in bow fishing adventure. It has a spectra line also allows you to catch large fishes, even sharks! It also contains cycle top giving out an easy and smooth penetration in almost all surfaces. Overall, this model is definitely good for both new anglers and those who are experienced. The whole bow structure is only 3.6 pounds in weight designed for both left and right-handed users. Generally, this device has a fairly good draw weight range of 30 to 60, a brace height of 7.5 inches, and a snapshot range of 15 to 31 inches. Although this product provides superior performance, it is still one of the most expensive designs in the market. The AMS Bowfishing E-Rad Bow is definitely a good buy if you are up for bowfishing. It is indeed proven durable even in harsh environment. This product also provides superior performance and a super-smooth draw. Generally, this model is definitely good for both new anglers and those who are experienced. Of the five top fish hunting bows we have reviewed, our personal favorite is going to be the Cajun Sucker Punch Bow. 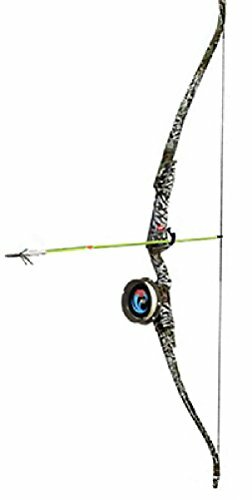 Although it has a more expensive price than the rest of the bows, it is still proven to offer a lot of great features. For its size and weight, it is definitely packed with a lightweight and adjustable design that allows you to play hunting with impressive comfort! It is also ensured that the Cajun Sucker Punch Bow will bring out the performance and durability you need for every bowfishing adventure even after years of usage. Spending time outdoors is can be a thrilling experience and especially when you are equipped with the appropriate regime! As we give you a truthful review for each product, we also help that you find here the one that definitely suits your needs. At the end of the day, choose the best one that fits your taste and the one that will provide you safety! If you didn't like any of the bows we've reviewed here, maybe you would like to see our review article of the "Best Recurve Bows"! !